Christopher Nieto is a young artist from Santo Domingo Pueblo who has excelled beyond his years in terms of the exacting precision of his traditional necklaces, both in terms of design and execution of the component parts of his pieces. All of his beads are handmade, whether he is working with turquoise, jet, mother of pearl, red coral, lapis lazuli or spiny oyster. His mosaic inlay work is second to no artist in its quality of craftsmanship. This full-length necklace represents a unique design in that the large, inlaid butterfly pendant is threaded by the six strands of purple spiny oyster beads. Purple you say? But this shell is yellow. Yes, it is golden yellow and it only occurs in portions of purple spiny oyster shells. Chris stockpiled this yellow shell bit by bit over a couple of years as he worked through many purple spiny oyster shells. You'll see hints of this purple in many places on the strands. The main focus of this necklace, however, is the very large inlaid butterfly pendant. 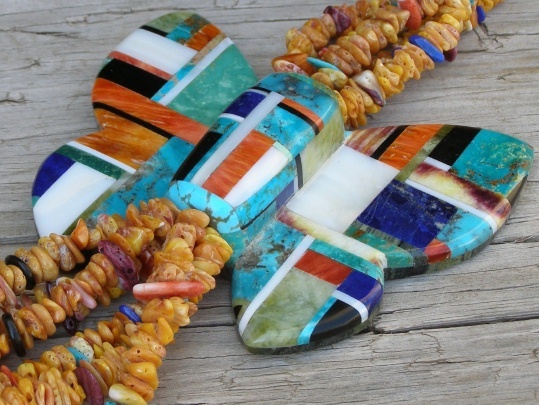 Built on a foundation of striped green serpentine, Chris used mosaic tiles of red, orange and purple spiny oyster, as well as jet, lapis lazuli, Kingman turquoise, serpentine, white mother of pearl and variscite. The pendant is strung on the strands so that it will stay in place. The weight of the strands counterbalances it so that the pendant remains at about half the distance up the left side of the necklace. Chris sprinkled the spiny oyster strands with chip beads of Kingman turquoise, lapis lazuli, jet and orange, red and purple spiny oyster. The beads are strung on polyurethane-sleeved braided stainless steel wire for strength. The polyurethane coating allows the beads to slide smoothly on the wire and prevents the wire from chipping the beads, while the wire lends extreme strength to the strands. The necklace strands measure 31 inches. The six strands of beads are gathered in Sterling cones before finishing at the handmade hook and eye closure. A photo of Chris (wearing one of his necklaces) can be seen in our Artists section under the letter "N". Inlaid Butterfly: wingspan 4"; length 3 3/8"